The White City by John Claude Bemis. A Clockwork Dark Book. 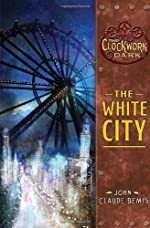 Review: A fantastic and adventurous tale, The White City, written by John Claude Bemis, is a blast of fantasy in the bustling city of Chicago. Action swarms around every corner as Ray and his friends fight off the darkness that could change the fate of the world. But as this daunting battle transforms to complete war, the World hangs on its final thread. No matter what the result of the war is, Ray's and Conker's lives are about to change forever. As the Clockwork Series draws into its third book, Ray and his friends work together from both sides in order to bring down the Gog. Ray and Jolie chase after Ray's sister while searching for his father in the Gloaming. Conker and his friends are already in Chicago and are attempting to retrieve the Nine Pound Hammer. Although the numbers are against them, and most of Chicago is under the influence of the Gog, the Ramblers are determined to foil his evil plans. But Ray and Conker are quickly running out of time. The Gog's machine, the machine of death destroyed by John Henry, is almost rebuilt. Ray and Conker must drive the hammer into the machine's heart before it awakes. But killing the machine is not enough. In order for the machine to truly be destroyed forever, the idea of it must be destroyed as well. This means that the Gog must die as well. Will Ray and Conker be able to save the world, or will the world's final thread snap after their failure? An amazing story of great courage and strength, The White City perfectly drew together American myths and legends into a fantastic fantasy. I would recommend this story and series to anyone who has an interest in fantasy or who wants to pick up a good book. I feel that The White City will attract readers ten and up mainly for its vocabulary. Before reading this series, I had no interest in mythology and very limited love for fantasy. By reading these books however, I have learned to give them a chance and have found that I enjoy them very much. I give this book five stars for its ties to mythology, fantasy, and historic America. John Claude Bemis is an inspiring author and I have high hopes that he will continue his writing career. In fact, I am positive that this is not the last time we will hear his name. Review written by Brandon (8th grade student). We would like to thank Random House for providing a copy of The White City for this review. Have you read The White City? How would you rate it?